The increasing incidences of various types of cancer such as Skin (melanoma and non-melanoma), Lung and Bronchus Cancer, Breast Cancer and Prostate Cancer across various regions exhibits significant increase in application of cancer treating drugs by oncologists evince significant rise in cytotoxic drugs market across the globe. Countries such as United States (6.8 Million cases), China (8.36 Million cases), India (2.04 Million cases), Germany (1.91 Million cases) and Russia (1.61 Million cases) are the leading countries with highest number of cancer population worldwide. The increasing prevalence of cancer worldwide among the population across various regions manifests discernible growth in cytotoxic drugs market across the globe. The introduction of Ayushman Bharat-National Health Protection Scheme by government of India and various existing prodigious healthcare systems in Asia and Europe such as Urban Residents Basic Medical Insurance by China, National Health Service by U.K. government, System of Social Security in France, Health and Medical Service Act in Sweden manifests significant existence of government participation in healthcare sector is rationale delineates growth in cancer treating cytotoxic drugs market globally. The elevation in the trend related to bioinformatics in developing regions across the globe delineates significant development in the cytotoxic drugs market coupled with the established bioinformatics infrastructural availability in developed regions of North America. Cytotoxic drugs market is anticipated to record a significant CAGR 1.2% over the forecast period. Many multi-national companies are concentrating towards new product advances in cytotoxic drugs. Moreover, the many advantageous properties of cytotoxic drugs are exploited in rheumatoid arthritis and multiple sclerosis treatment. Currently the global cytotoxic drugs market is observing vibrant growth on the back of increasing demand of cancer treatment drugs in the market. Advances in healthcare industry in the past few years and growing bioinformatics explorations are projected to drive cytotoxic drugs market besides the wide range of functions of cytotoxic drugs in lowering cell reproduction and decreasing byproducts produced by the cells that cause inflammation in rheumatoid arthritis and lupus during the forecast period. On the basis of regional platform, global Cytotoxic Drugs market is segmented into five major regions including North America, Europe, Asia Pacific, Latin America and Middle East & Africa region. 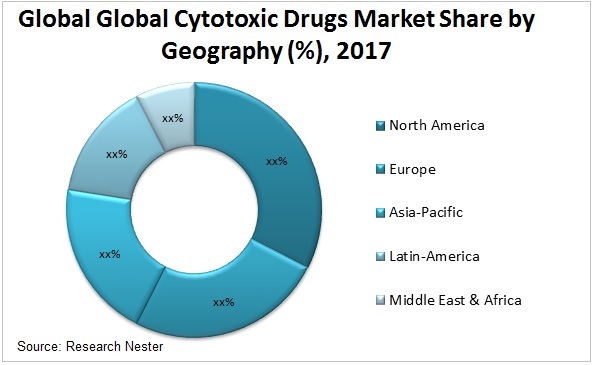 As a developed healthcare region, North America is panned to observe extensive growth in cytotoxic drugs market on account of rising cytotoxic drugs usage for treating autoimmune disorders. North America is anticipated to be followed by Asia Pacific in terms of consumption due to increasing number of specialty programs initiated by the regional governments. Faster drug consent processes, increasing prevalence of cancer, and rising adoption of targeted therapies are the primary growth drivers for global cytotoxic drugs market. Frequent introduction of new drugs has resulted in rise in competition. Cytotoxic drugs, such as disease-modifying anti-rheumatic drugs (DMARDs) are used for treating rheumatoid arthritis and lupus which is expected to initiate new trends in the market. Rising R&D activities regarding cytotoxic drugs is resulting in the introduction of advanced treatment options that are more effective and efficient. Ongoing studies on similar drugs designed to minimize side effects are expected to propel the market for cytotoxic drug classes. Moreover, several domestic and international policies devised by the government from several countries such as U.S., India, Germany, and U.K. and several other European nations to enhance and carve the healthcare support to the citizens is anticipated to bolster global cytotoxic drugs market. Higher investment in various international healthcare programs financed by various governments and organizations such as global health protection program by government of Germany and National Cancer Control Programs by World Health Organization exhibits increase in investment of healthcare signifying the growth of cytotoxic drugs market globally. The integration of various drug development processes aligned to cancer treatment with the auxiliary software and system tools as bioinformatics evince the revamped facilitation to cancer treatment and research related to it. However, stringent regulations leading to delays or denials in cancer drugs approval along with critical shortage in availability of cytotoxic drugs in pharmaceutically developing countries is estimated to cause hindrance in the growth of the cytotoxic drugs market over the forecast period. Furthermore, introduction of alternative forms of cancer treatment with increasing technological advancements is expected to restrain the cytotoxic drugs market growth.